Garage Door Off Track ? Need Fast Garage Door Repair Today? Is your garage door off track and is now difficult to operate or totally stuck? Garage doors can veer off their tracks for various reasons such as a broken spring or an obstruction in the path of the door. Car bumpers, boxes, trash cans, or other objects that are solid enough can stop the door with enough force to dislodge it. Aladdin Garage Doors is a full service garage door repair company serving Houston and surrounding areas. Our garage door technicians are trained to troubleshoot and resolve garage door repairs and other overhead door systems that have come off their track. Whether we need to take apart the entire door and reinstall it, or we simply have to put a few rollers back into the track, our experts will solve your problem quickly. Call 281-252-3346 now! Safely Repair Your Garage Door Off Track! With a garage door off track, the solutions vary so having a professional troubleshoot and make the repair is safer, faster, and often less expensive than attempting a repair yourself. Garage door springs are under tension and attempting to fix the problem yourself can result in serious injury or, at the very least, additional damage to your garage door and items in your garage. Garage door tune-ups including door track maintenance. 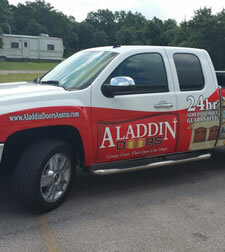 Why Choose Aladdin To Get Your Garage Door Back On Its Track? When you choose Aladdin Garage Doors Houston to help you with your garage door off track, you are hiring a small, local, family-run company that’s large enough to serve all of your door services needs 24/7/365. But, we’re still small enough to treat you as if you were our only customer and make sure you are 110% satisfied with our services. 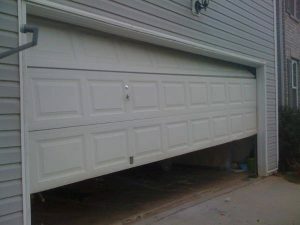 If your garage or overhead door has come off its track, we can help you get the door operational again quickly and economically. If you’d like to receive an estimate to repair or service the commercial door system in your building please give us a call 281-252-3346 or fill out our contact form and someone will be getting right back to you.